Few American literary figures have levied a more durable impact on popular culture than Edgar Allan Poe. At 40, Poe, who died in 1849 shortly after he was found in a ditch in Baltimore apparently wearing someone else’s clothes, had experienced a difficult life since his earliest years, battled alcoholism, amassed enormous debt, became a widower at a young age and found scant validating evidence that his work would endure past his life. Neither his poems nor his single novel (The Narrative of Arthur Gordon Pym of Nantucket) sold as well as a school book about conchology that was essentially an abridgment of an existing work. Poe’s defenders often are more passionate and insistent than his detractors, as evidenced by how his poems and short stories are, for better or worse, inextricably embedded in the American cultural mind. Go to Internet Movie Database, for example. Dead for more than 165 years, Poe has, as of press time, 336 writing credits to his name for short and feature-length films – an accomplishment that few other screen writers can claim or surpass (as a comparison, the horror writer M. Night Shyamalan has 17 as a writer and has 12 industry awards to his credit). New cinematic productions that interpret Poe’s short stories are announced regularly every year. 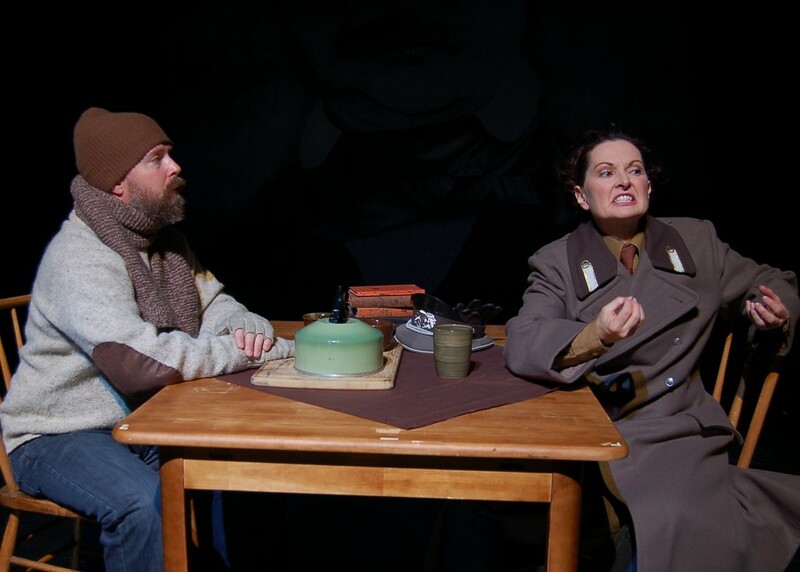 From Meat and Potato Theatre, Poe’s The Purloined Letter with Josh Thoemke as Dubov and Rebecca Marcotte as Inspector Rostnikovich. Nine of Poe’s works, including his most well-known and frequently quoted writings, are reinterpreted, some with solidly memorable results, in Meat & Potato Theatre’s latest production con-tem-POE-rary, which continues through June 12 at the Studio Theatre in the Rose Wagner Center for Performing Arts. Although the show could use a fair bit of pruning – with some pieces missing an ideal pace because of, frankly, too much script material – the entire cast of four actors is sharp, witty, commanding and versatile, as it moves through the anthology, which offers many cleverly imagined moments. In the first act, The Tell-Tale Heart, which also quotes musically Bill Haley and The Comets’ classic Shake Rattle and Roll, Jeffrey Howard Ingman and Rebecca Marcotte (always a strong performer in the company’s productions) play husband and wife in a 1950s setting without any dialogue. It is outstanding dark physical comedy, as Marcotte deals with her husband’s annoying peculiarities. Equally up to the task is Josh Thoemke who plays the policeman. 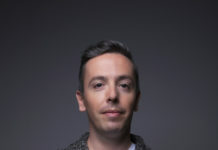 In all instances, Tobin Atkinson, who directs the production, adapts Poe’s work faithfully even as he modernizes the story’s characters and settings. With The Tell-Tale Heart, Atkinson also highlights the best feature of Poe’s work – without dialogue, not so ironically. The piece is immediately followed by Raina Larkin Thorne’s excellent performance as a mid-century torch singer rendering Annabel Lee, composed with original music by Rob Hartmann. Likewise in the second act, the quartet (Ingman, Marcotte, Thoemke and Thorne) executes with very good results Poe’s The Bells, featuring music by Hartmann and choreography by William Richardson. Hartmann’s original score throughout is one of the show’s strongest assets. He also composed the score for Aliens The Puppet Musical, a Meat & Potato Theatre’s production, which also is now available in book form, courtesy of Elkhound Press. While the acting in both MS in a Bottle (a short story Poe wrote at the age of 24 but reimagined on a ship with advanced technological capabilities) and The Purloined Letter (recast in the tense days following the collapse of the Soviet Union) are as solid as in the production’s most effective pieces, both interpretations sag, echoing the biographer’s remarks and suggesting that Poe’s pedantic and boring style would have benefited from significant editing. Indeed, these two entries could have been excised from the show without much impact. However, the rest of the show offers a good deal of worthwhile entertainment. The opening rendition of The Raven sets the appropriate mood immediately for The Cask of Amontillado, brought forward to the 1990s but with the same famously bittersweet taste of revenge – this time a philanthropist who is hosting a costume soiree at the Cannes Film Festival. The second act opens with a wonderfully on-point interpretation of Poe’s satirical essay How To Write A Blackwood Article. In fact, Atkinson’s adaptation heightens the original’s satirical effect with worthy results. With Poe, the rule always should be never hesitate to broaden the guidelines for parody, satire, and naughty humor – all of which work nicely in the company’s adaptation of the Poe essay. 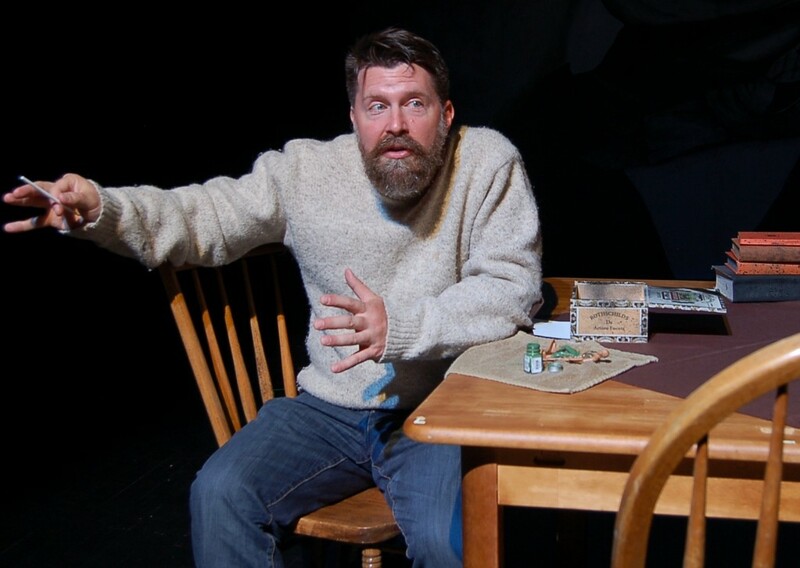 From Meat and Potato Theatre, Josh Thoemke in Poe’s The Purloined Letter. 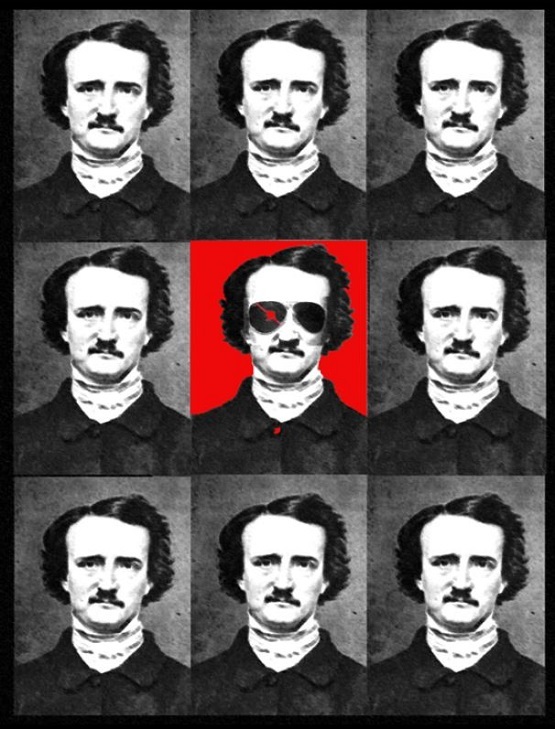 For true lovers of Poe’s writing, con-tem-POE-rary is a satisfying feast. For the less enthusiastic fans, the show demonstrates quite effectively just how Poe, whether one would welcome it or not, likely will always be a throbbing tell-tale impulse of American popular culture. In a slimmer form, the show would even be stronger. Produced by Marynell Hinton, con-tem-POE-rary includes lighting design by Megan Crivello and scenic design by Ruth Weisman. 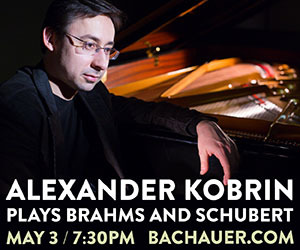 For tickets and more information see here.